Proximity HD is a simplified strategy game for up to four players. You have five tiles in your hand at any given time, each tile with a number on it from 1 to 20, representing the strength of that tile. 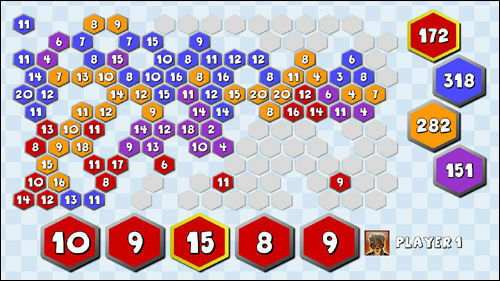 Each turn, you can place a tile on any empty space on the hex-based board. Once that tile is placed, it affects any tiles surrounding it. Tiles that belong to the same team are reinforced by 2 points, enemy tiles with a smaller number than the tile placed are captured, and enemy tiles with the same or higher numbers than the placed tile have their strength reduced by two points. After the board is filled, the scores on all the tiles are added up and the team with the highest score is considered the winner. There are plenty of tweaks and settings to tinker with, for example computer AI, winning conditions, map and even gameplay types.